We have all been there. You have. I have. Every single teacher you know has been there. The kids are in bed and you have 3 minutes to yourself. You decide to hop on Pinterest… because who hasn’t done that. You find this amazing pin that is just genius. You know it’s going to be the biggest game changer in your classroom and you’re never going to look back. How did you live before you found this pin? You immediately order the supplies for it on Amazon (that is, if you aren’t already hoarding the supplies in your school closets). …and it’s doesn’t work. Because that Pringles can you’re now using to store rulers in looks super cute, but it still smells like Pringles, and now your kids keep chewing on the rulers that smell like Pringles. But there are those times when that genius pin… that genius pin just. works. perfectly. The stars align and your life is for real forever changed. 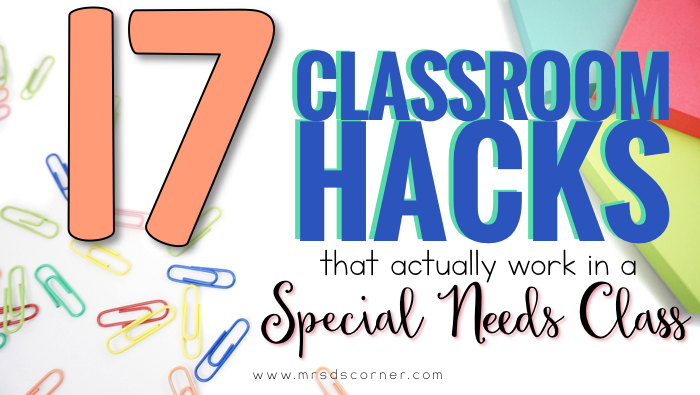 And those are the ideas that I am going to share with you… those star aligning classroom hacks that will actually work in your special needs classroom. 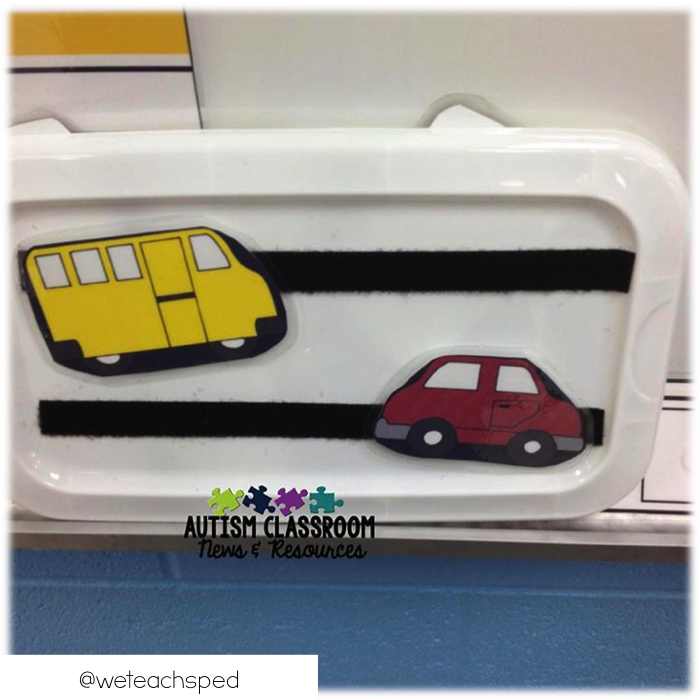 Slant boards are expensive, but also a huge necessity in any special needs classroom. 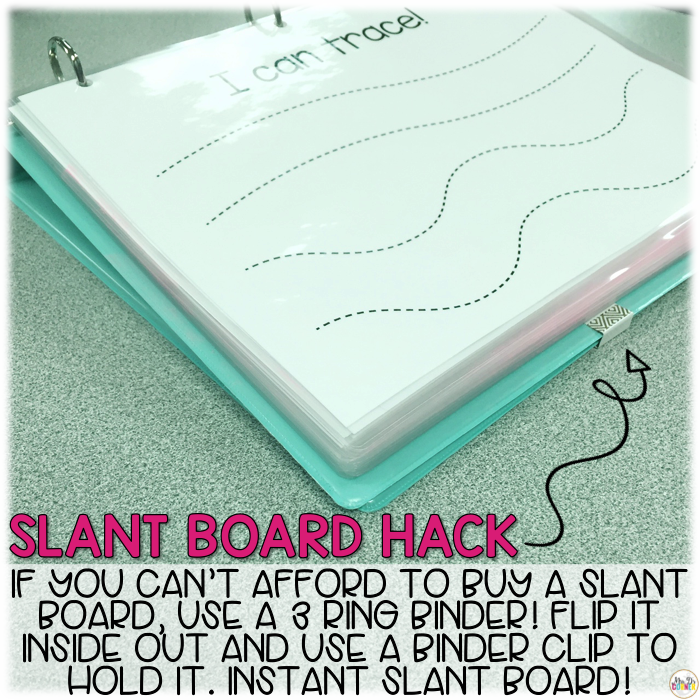 Easily make your own with a binder clip and a 3-ring binder! 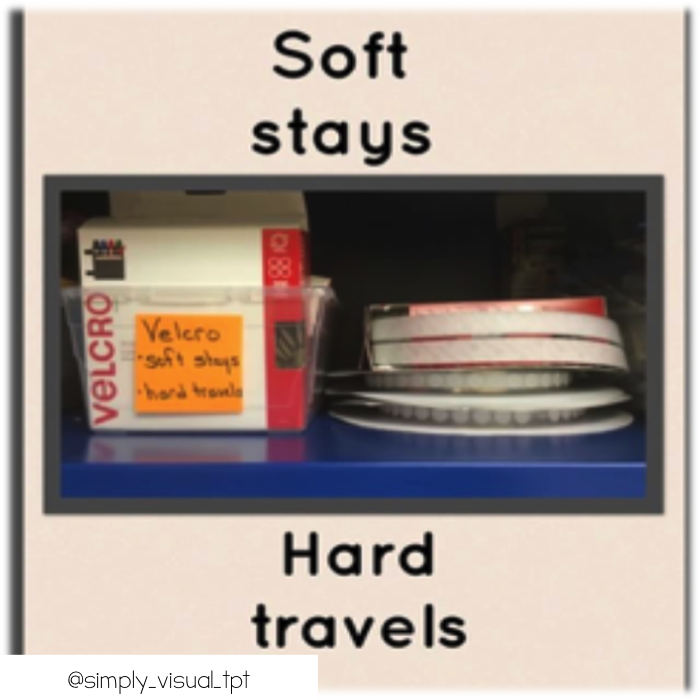 Put labels by your Velcro so you never forget which end goes on what. GENIUS! No more pushing in glue sticks… no more eating glue sticks like butter… no more chapstick glue… GLUE SPONGES will change your classroom. GLITTER glue sponges are the best because kids will work for them. Use them as a good behavior incentive, at a VIP table, or for the Student of the Week. Practice putting things away in the correct order by simply taking a picture of what the put away bin should look like and taping it to the front of the bin. Best hack ever! Enlarge clip art and print in poster size using Adobe. 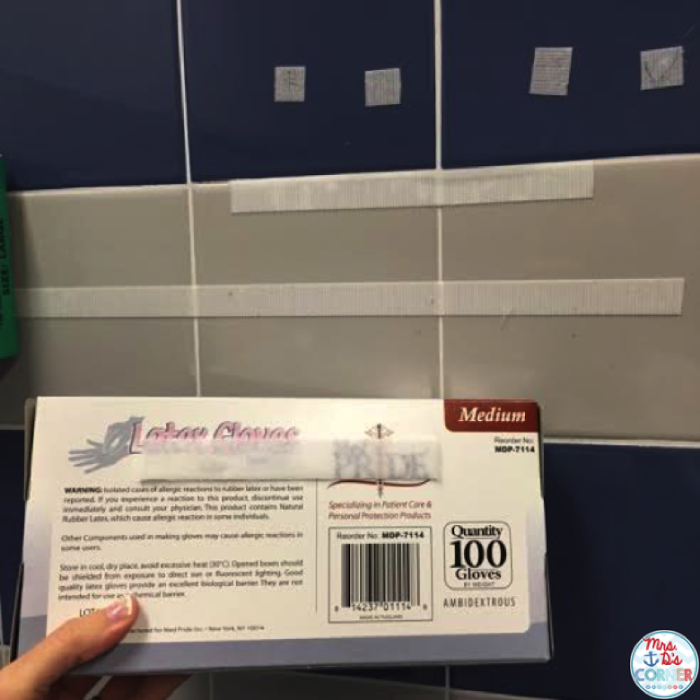 If you have a classroom bathroom and don’t have any immediate storage for your gloves, simply Velcro the box to the wall. Change out the box when it gets emptied and you’ll never be stuck in a messy spot again. Classroom bathrooms have the potential for… umm… a lot of different, erm, smells. 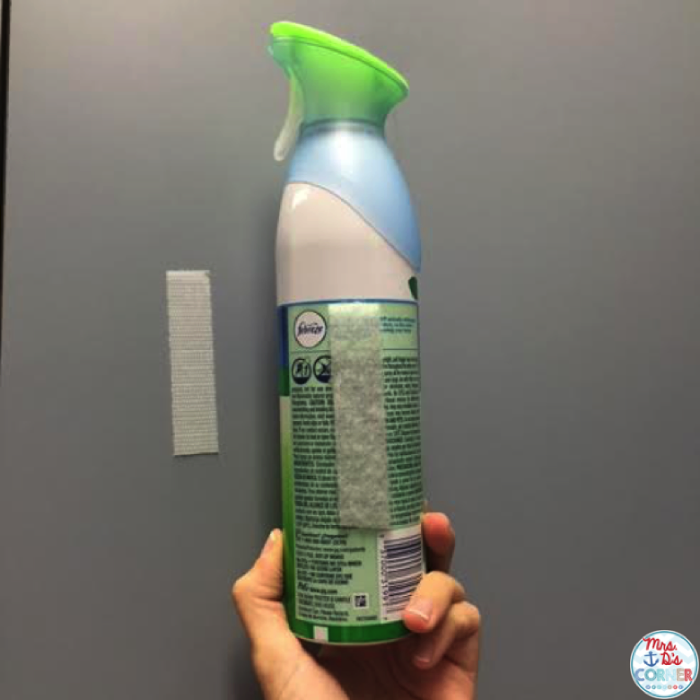 Simply Velcro your booboo spray on a high cabinet (so the kids can’t reach it), but so that it’s easily accessible for a quick spray. 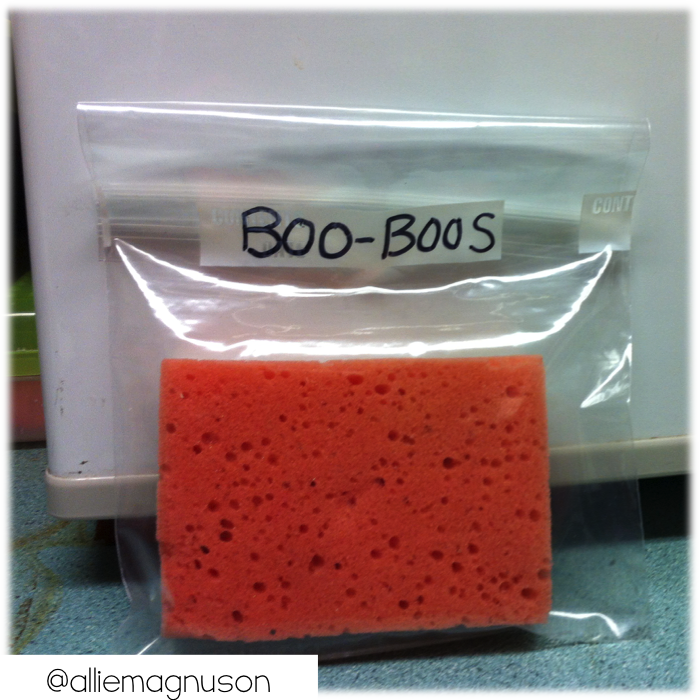 Dollar store sponges, slightly wet, and frozen in the freezer… instant boo boo healer. Simple and cheap! 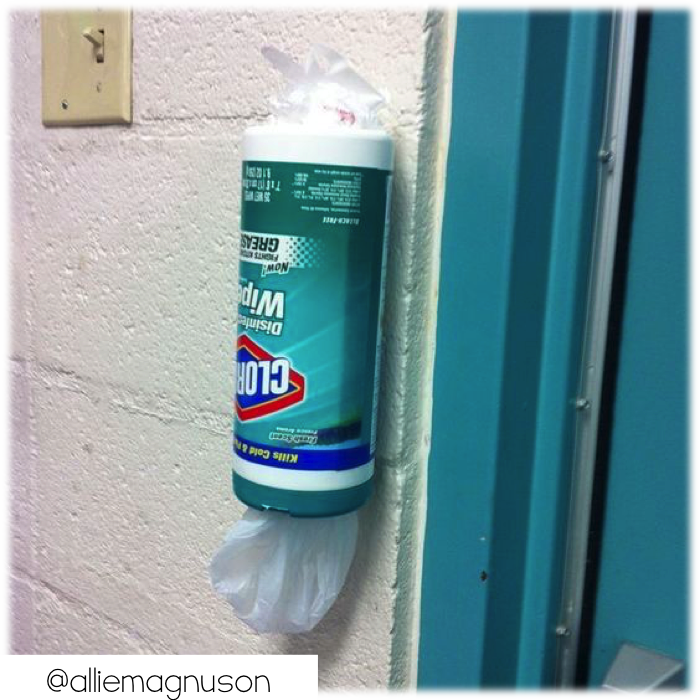 Cut the bottom out of a Clorox container, take the lid off, Velcro it to the wall and use it for a store bag container. Great for when students have bathroom accidents and need to change clothes (…and the clothes need to be sent home). 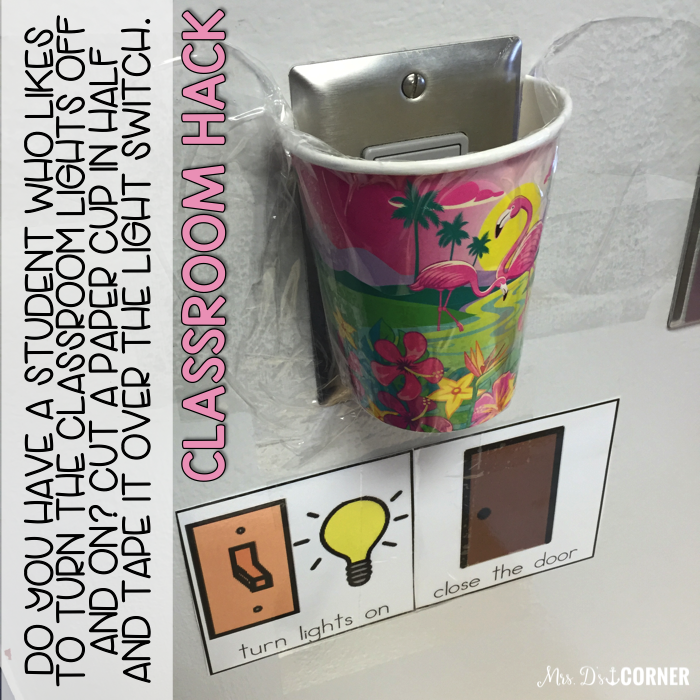 Have a student who likes to turn the lights off and on? Cut a paper cup in half and tape it over the light switch. You can also use plastic bins to cover up the switches with Velcro. 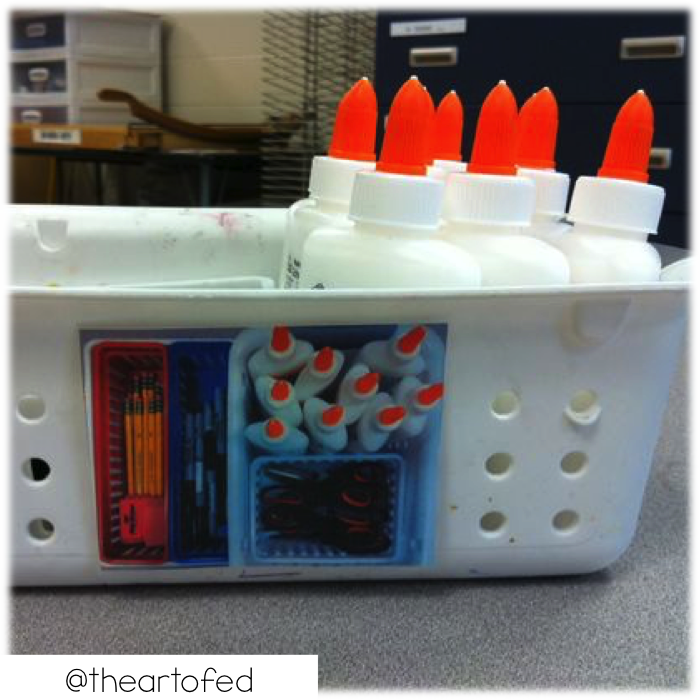 Use those random extra bin lids that all special ed teachers have laying around… and put them to use for visual schedules. Much sturdier than laminated paper or cardstock! 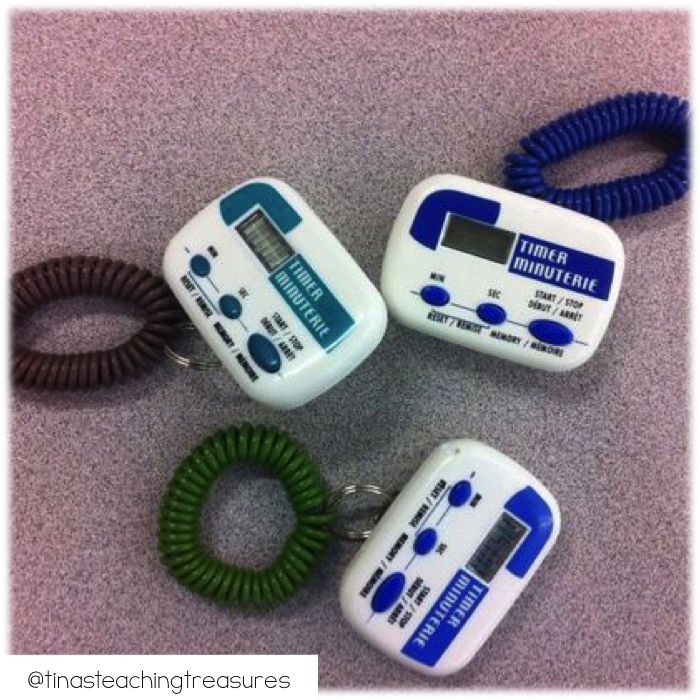 Attach your classroom timers to a bracelet… and you’ll never lose your timers again! You know that I already know how much you frequent the Target Dollar Spot and Dollar Tree. It’s not a secret, but we can pretend. 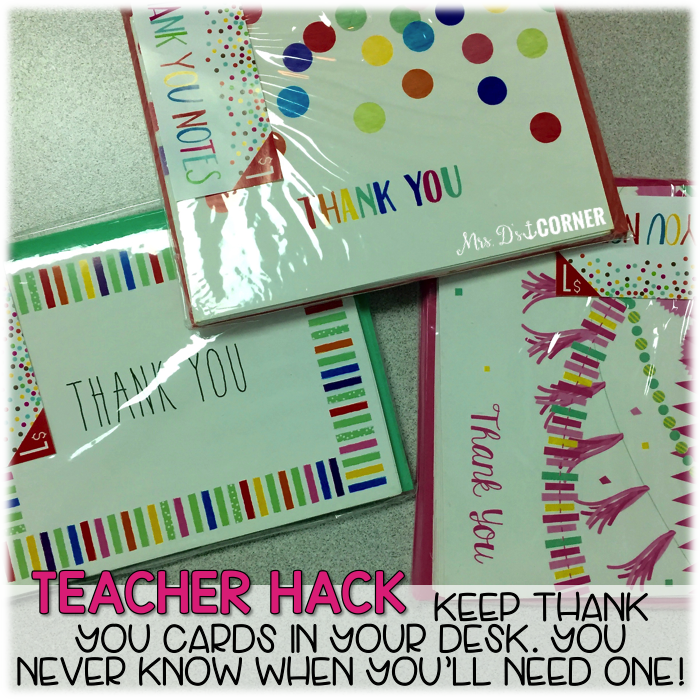 Grab a few packs of Thank You cards and blank cards to keep in your desk. You never know when you’ll need one! This hack changed my life during my first year of teaching. You need one folder that has prongs inside, and one or two paper folders. 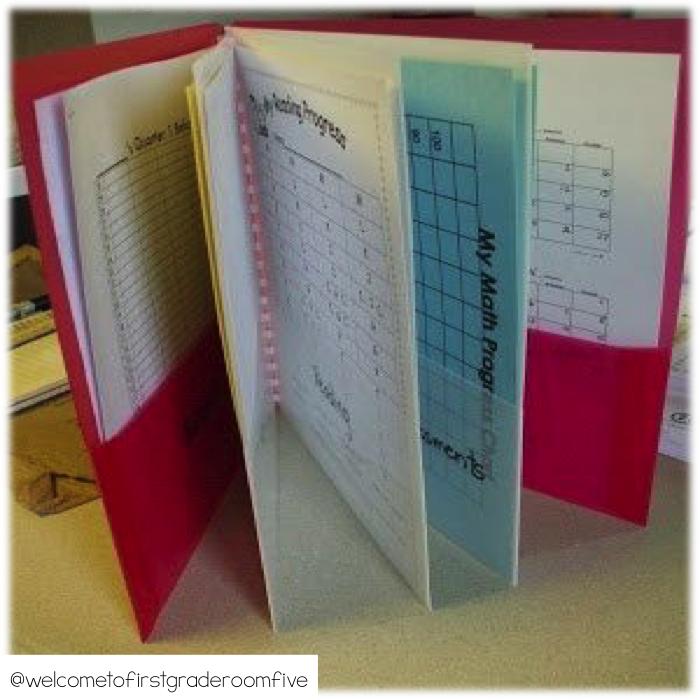 Flip the paper folders inside out, hole punch, and insert into the pronged folder. Now you have lots of folder pockets to store work samples, IEP data, and everything else you need. Simple and cheap to make one for each student! Book bins for your classroom can be expensive, let me just tell you. 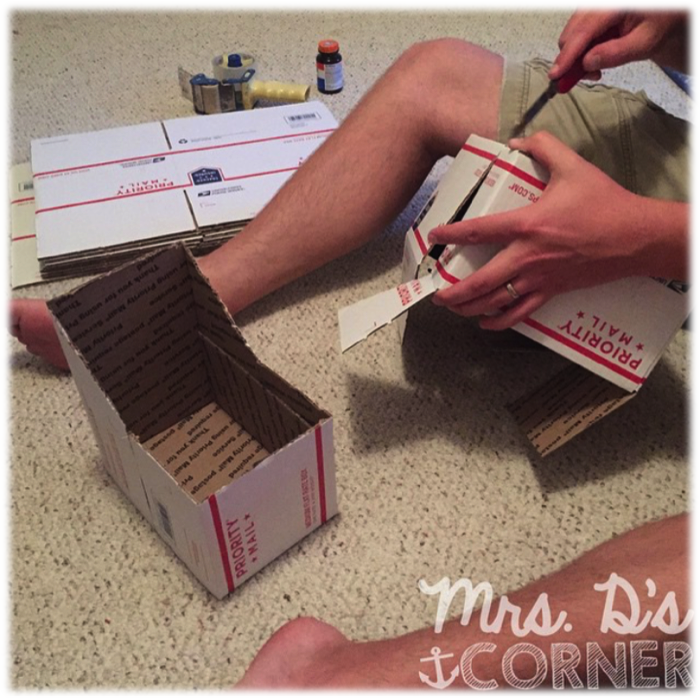 So grab a few of the Priority USPS boxes at your local post office (they’re FREE), and make your own book boxes. 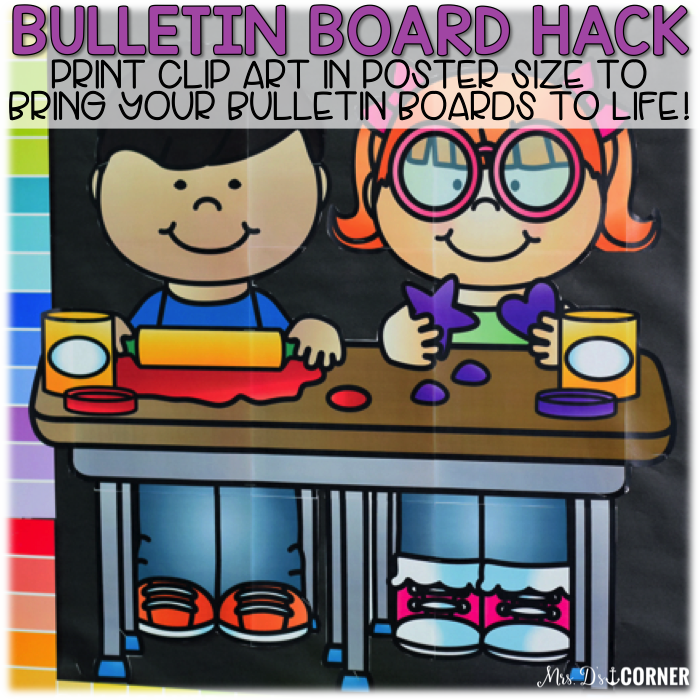 The cardboard is super sturdy, add some monkey glue to keep them together or duct tape, and then add a front label or spray paint to match your classroom. 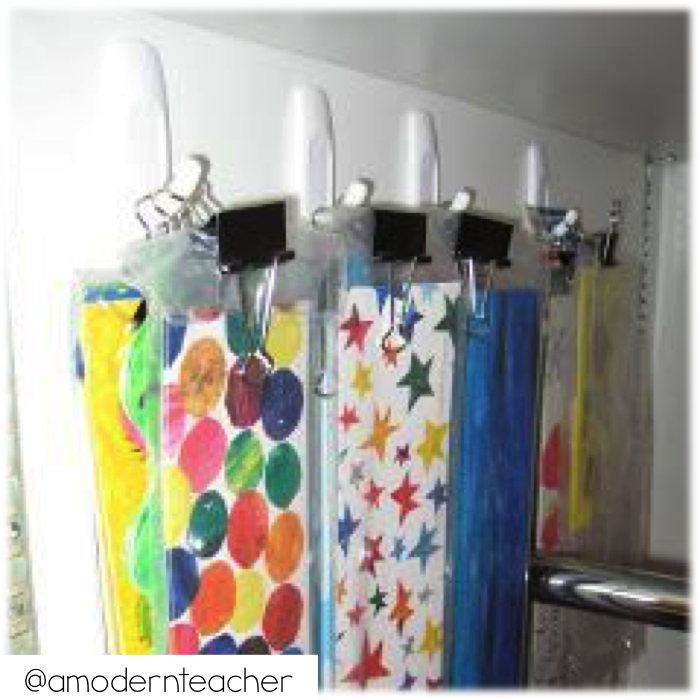 To try out a few more classroom hacks, check out my Pinterest Board. 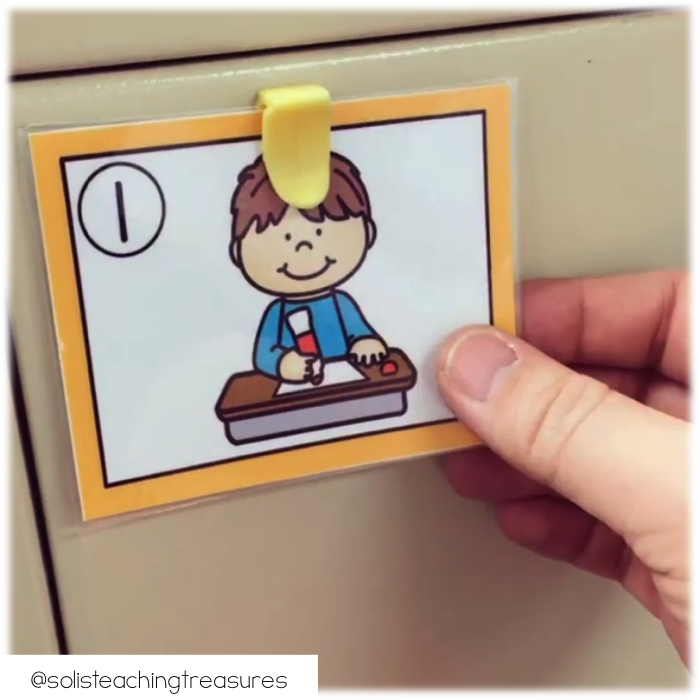 What’s your favorite classroom hack that works for special ed classrooms too? These ideas are awesome! I wish I had found your blog in the BEGINNING of the school year! Excellent ideas! I found them very useful, even for this seasoned special ed. teacher. Thank you! I always kept 2-3 weeks ahead in my lesson plans and wrote out in a chart what copies needed to be made for what lessons-attached any that weren’t already printed onto the clipboard. That way if there was down time, my TA could run off copies and put them away where they needed to be. She could also get out the next week’s lessons and supplies. She highlighted what she was able to get done. I wish I could get my TA to do that and off her phone. But she did make a nice food board. Another thing that was a real sanity saver for me – testing supply bags. I had a student who REFUSED to write if his pencil wasn’t sharp enough; a real problem during standardized testing. I make bags (quart size freezer zip bags) with three sharpened pencils, two cap erasers, a pink pearl eraser, a pencil grip, and a small pencil sharpener. That way, the students can always have sharp pencils, can sharpen their pencils into the bag, and NO reason to get out of their seat and disrupt the testing environment. 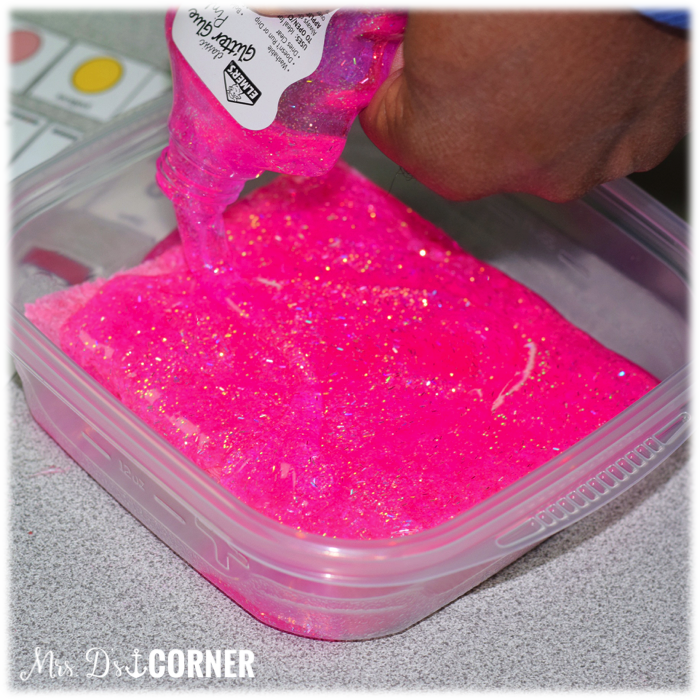 How does the glitter glue sponge work? for book bins – during school supply time, I go to Walmart and grab the boxes that are empty. These are the boxes that held folders, notebooks…. They are already cut and come in various sizes.